Day 5 was a bit of a travel day as we boarded two small, private planes and flew from Oaxaca to Tuxtla Gutierrez in the southern most state of Chiapas. 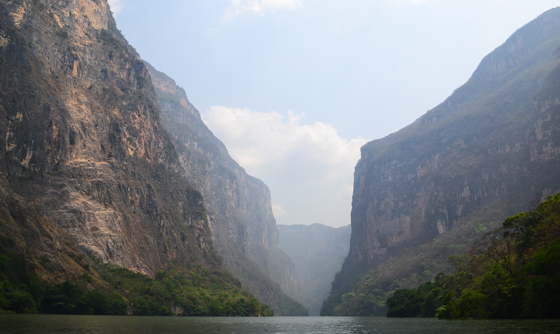 From Tuxtla, we transferred to Chiapa de Corso for a boat ride through the Sumidero Canyon. The canyon itself was impressive with its walls climbing thousands of feet towards the sky, but I was more impressed with the history of the canyon. Our Journey Mexico Chiapas guide, Roberto, explained to us that when the Spanish conquistadors arrived in Chiapas with ally Mexican Indians, they met resistance from a specific group of natives in the area. Out numbered but refusing to give in to the Spanish, this group ultimately retreated into the canyon using its steep walls and narrow entry as natural protection. Hernan Cortez and his troops eventually caught up with the rebellious natives and destroyed them. After the canyon, we had lunch in Chiapa de Corso then continued on the highland city of San Cristobal de las Casas, where the climate is drastically cooler than that of the lowlands from where we came. 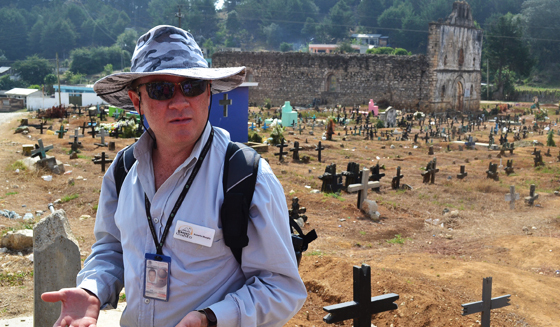 Our group was immediately impressed by the beauty of San Cristobal. It has a very European feel with its narrow streets and abundance of cafes, restaurants, bars, and shops. 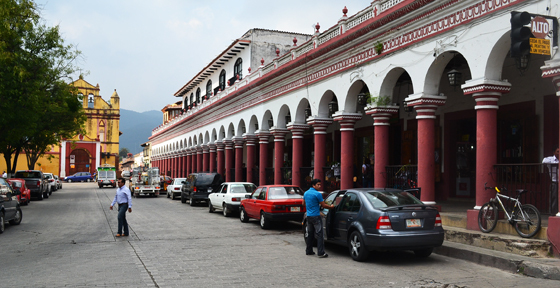 The city has a very bohemian vibe going on and I was surprised to see the amount of European travelers who looked like they’d been camped out in San Cristobal for some time. Before settling into our hotel, we did site inspections of Villa Mercedes, Casa Felipe Flores, and Casa Mexicana (where we have been staying). Day 6 began with breakfast in the hotel as usual, which was followed by a trip into the outskirts of town to a village called San Juan Chamula. Roberto gave us some nice insight into the history of the local people on our way out, explaining how the Chamula peoples’ ancestors were one of the few groups to never be fully conquered or captured by the Spanish. Their ancient traditions still carry on today, and we were lucky enough to be permitted into their church to witness their most unique customs. 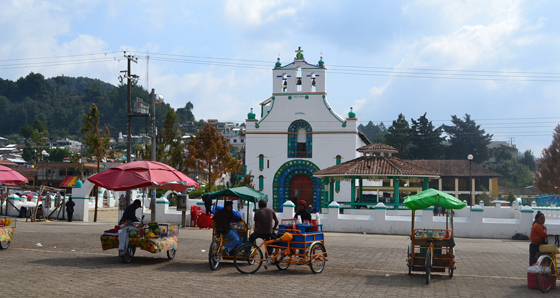 The Chamula are still considered “pagan” by the catholic church, even though the religion they practice is sort of a mash-up of catholic and ancient native beliefs. Roberto told us several of the parables they hold to be true including one in which Jesus had a younger brother who was basically murdered by Jesus for being too greedy. Inside the church (whose floor was covered with pine needles, burning incense, and lit candles), we witnessed many local shamans performing healing rituals on the sick. Some of the rituals involved rubbing the back of the sick person with chicken eggs, steady chanting, and the drinking of a locally brewed rum (called Posh), which they would also pour out between the candles for the Saints to drink. The most striking ritual actually involved a sacrifice. Roberto explained that the Chamula people believe that certain illnesses are caused because a piece of the sick person’s soul has been taken by dark spirits. To retrieve the piece or pieces of missing soul, a shaman will offer the spirits a chicken in exchange for the soul. To do this, the chicken must be killed right there in the church. In the fifteen or so minutes we were in the church, we probably witnessed four or five chickens being strangled in sacrifice. Roberto noted that Priest of the church (who had been thrown out by the people many years before) is occasionally called back to the church to baptize the children. After he performs the baptism, however, he is then asked to leave again as he does not approve of the sacrifices, rituals, and the drinking of posh within the church. (See reactions of our visit into the church from three members of our group below). From San Juan Chamula, we drove to another local village called Zinacantán, where we again had the pleasure of being welcomed into the home of a local family to learn about their customs. This particular family produced brightly colored rugs which are woven on what they call a back-strap loom. 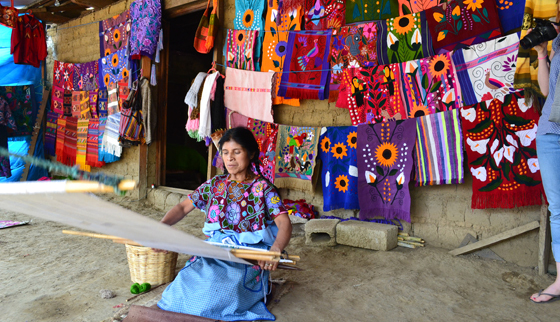 One of the women ties the one end of the loom to a post and attaches to the other end to a belt that is worn around her back. Leaning backwards to create tension in the loom, she weaves intricate patterns into the rug. Many of our group purchased rugs and table runners from the family as they were too beautiful to pass up. Before leaving the home for an incredible open-air buffet lunch, we were treated to some homemade quesadillas with beans on blue tortillas as well as a few bottles of homemade posh. It was tough not to spoil our appetites with more than one quesadilla as they were so delicious. The posh was tasty as well – and potent! In fact, two of our group members enjoyed it so much they “got married” in traditional Zinacantán wardrobe. Although the wedding only lasted a few minutes, it was a beautiful ceremony. After lunch, we visited the enchanting estate of the Parador San Juan for a site-inspection then returned to the hotel to relax before a lovely Italian dinner on a terrace overlooking one of the many lively streets of San Cristobal. Tomorrow, we travel to for Palenque, stopping at several ancient archeological sites on the way. Stay tuned for more to come!